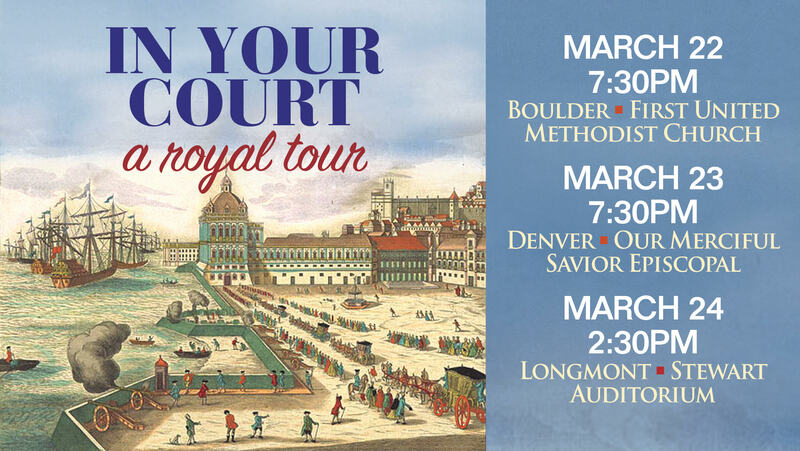 Join Seicento for a fascinating European journey highlighting music created through royal patronage in the Baroque era. Sacred works by Johann Kaspar Kerll, Charpentier, and Lully are rounded out by secular and theatrical music by Rameau and Purcell. Also on the program are the prologue of an early Italian opera by female composer Francesca Caccini and a Russian Orthodox Easter hymn by Diletsky. The concert will provide a rich tapestry of musical styles and languages, illuminating both the connections and the national differences of music from the Royal Courts. The Highlands Center’s Highland Hall, in the Julian Pavilion. Just north of 29th St., between Irving & Lowell. 5 minutes’ drive west from the Speer Blvd. exit on I-25. Plentiful street parking. Friday, March 22 in Boulder. 7:30pm at First United Methodist Church, 1421 Spruce St.
Sunday, March 24 in Longmont. 2:30pm at Longmont Museum’s Stewart Auditorium, 400 Quail Road. Beverages/snacks for purchase at 1:30.